When I forget to cook our lunch or dinner – believe me, it happens – fennel becomes my best friend. I buy fennel bulbs by the box at the market, I choose the chubby ones, as they are more tender, firm to the touch, with bright tops. I stash them into the fridge for those moments of forgetfulness. When the meal I’m planning to put on the table is somehow too frugal, I quarter a fennel bulb and pile it onto a plate, serving it along a little bowl containing extra virgin olive oil and a generous pinch of salt. This is what we call pinzimonio, a way to indulge in the freshest raw vegetables, dipping them in your best olive oil. 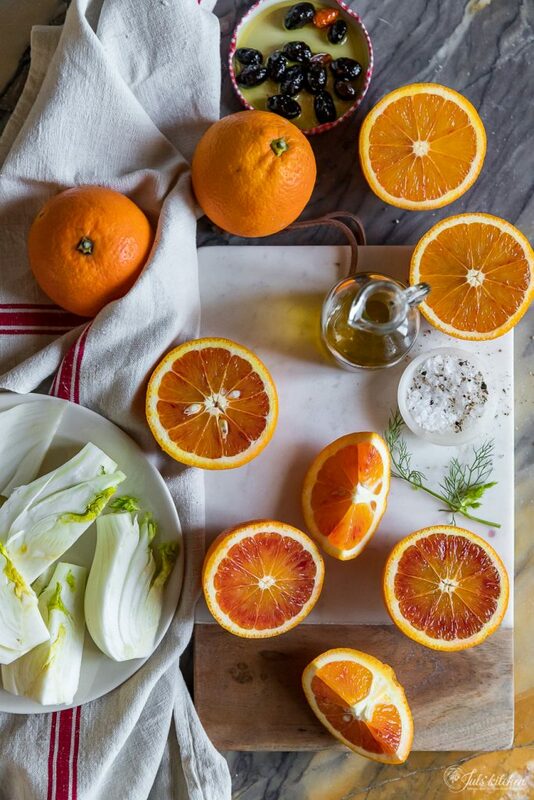 Fennels marry beautifully another seasonal ingredient, oranges, especially blood oranges. A fennel and blood orange salad is my winter go-to side dish, especially when the main course is either grilled fish or pork chops. When I forget that I have a meal to prepare, though, this salad welcomes other ingredients and becomes a main. My favourite addition is crumbled feta cheese, but I like to add also anchovies or herrings, or a buffalo mozzarella, if you listen to Tommaso. Have ready some crusty bread, and more olive oil. 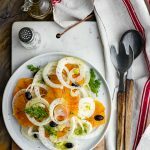 This orange and fennel salad is a winter passe-partout, a seasonal side-dish but also an interesting main course when combined with cheese. Rinse the fennel bulb and slice it thinly, including the tops. Tommaso prefers thicker slices, so that they can be slightly crunchy. Peel the oranges and slice them. Collect in a bowl the sliced fennel and oranges and a handful of black olives. Dress the salad with your best extra virgin olive oil, salt and pepper. Serve immediately, otherwise it will become quickly watery. I know, I told you this is the recipe I make when I forget I have to cook dinner. 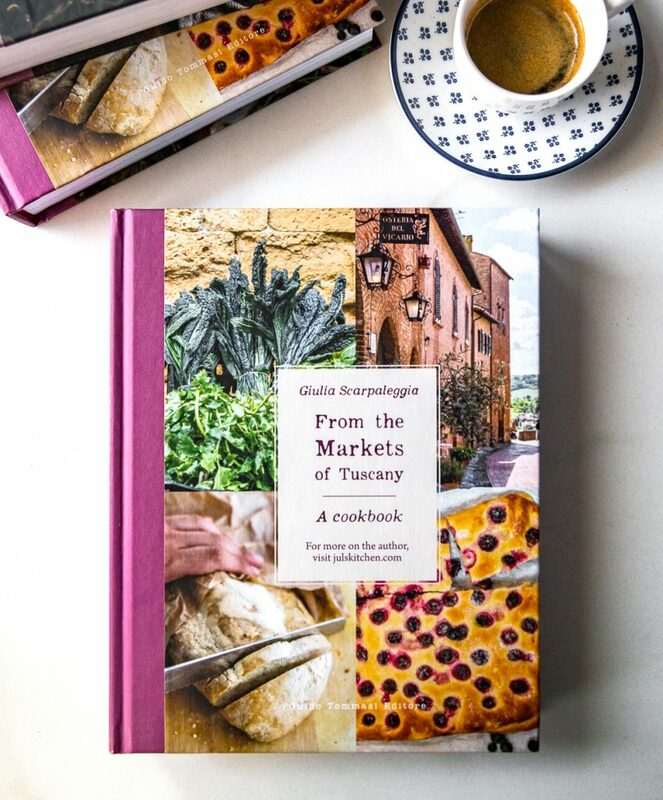 Should I have time to plan a meal, though, I’d start with tagliatelle with romanesco and anchovies and I’d make the butternut squash and lamb meatballs the star of my menu. 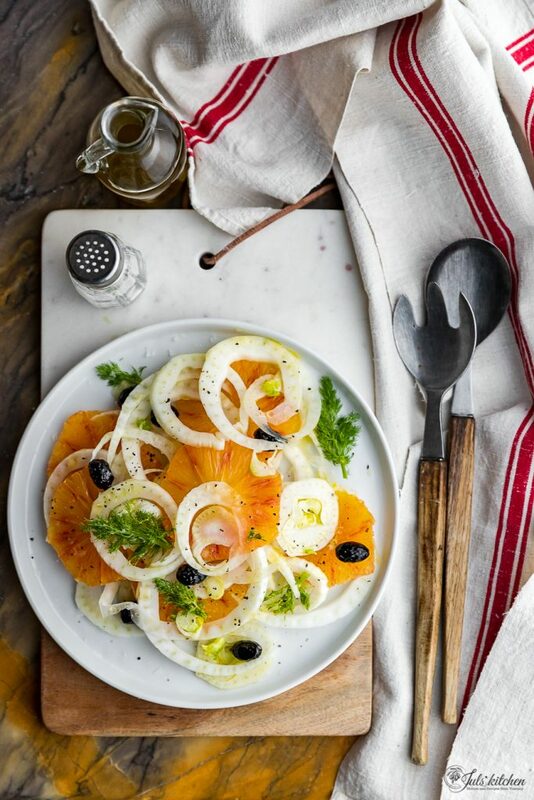 This blood orange and fennel salad would be a nice side-dish. As it is still winter, a zabaione would close my meal. What would you serve this salad with? Tagliatelle with romanesco, anchovies and burrata. The main protagonist is the romanesco. You can substitute it with cauliflower or the more common broccoli, although I find that this wonder of nature, the romanesco, so wonderful in its fractal conformation, has also the most delicate texture and creamy taste compared to the other cruciferous. Butternut squash and lamb meatballs. The butternut squash and lamb meatballs have a distinctive flavour, they are moist and sweet, with a warm orange hue. Brighten them up with a spoonful of pesto and a few wedges of orange and serve them as a main or into a soft bun if you have leftovers. Zabaione. Zabaione has such a long and fascinating story as it is made with ingredients which were easily available to families. It is relaxing and rewarding to make a zabaione, but it doesn’t even get close the pleasure of sharing it with someone you love in a cold winter day. This is an unusually short blog post, but this week we’re brewing some exciting news, and we’re very late on other deadlines, too. Come back here on Friday to celebrate 10 years of Juls’ Kitchen and discover our new exciting – and frightening! – project. Christmas side dishes. 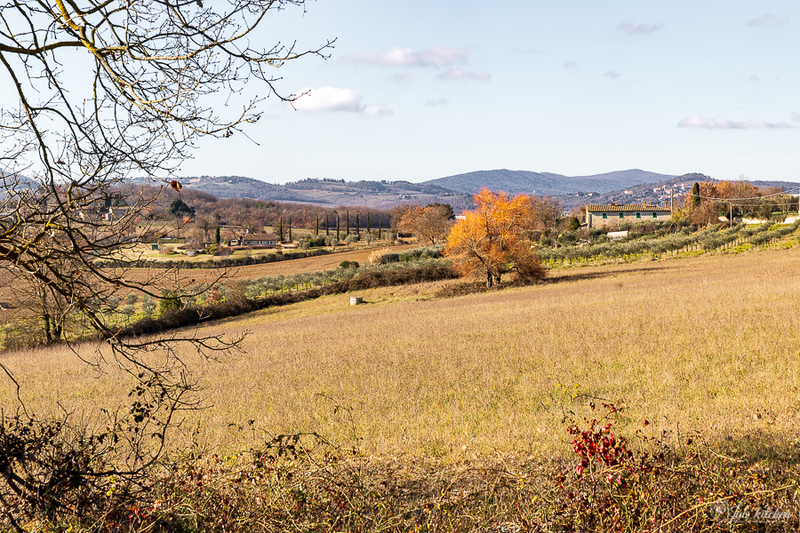 Artichokes, fennels and simplicity A Tuscan Christmas lunch – panforte, a spicy cake from Siena Citrus Yoghurt Cake for Great British Chef Citrus marmalade with oranges, lemons, bergamots and citron.